This post contains affiliate link for toys I personally own and love. I may receive a small commission, at no extra cost to you, should you wish to make a purchase through these links. Congrats on entering the golden age of babyhood! Your baby may begin to smile and discover playing with his hands and feet. He’s most likely settling into a schedule with more awake hours during the day and less crying for milk at night. Also, independent mobility has yet to be achieved (aka your baby will continue to stay pretty much where you place him, limiting mischief and mayhem) so enjoy this golden period of babyhood while you can! There are developmental activities you should continue to do since 0 – 3 month such as tummy time and face time. During this golden period of babyhood, development activities should be focused on preparing for two important milestones – sitting and crawling. Let’s first look at some of the developmental milestones for 3-6 month old baby. You are your baby’s best advocate. If you have a concern about your child’s development- whether it’s because some areas are lagging, or because a skill that was mastered seems to have forgotten, or you just have a gut feeling that something isn’t right – check in with the doctor. Most likely, there’s no problem at all (some babies are just late boomers). If a lag is identified the right intervention or activities will help your little one maximize his developmental potential. Babies develop from the top down, from head to toes. Babies lift their heads up before they can hold their backs up to sit and hold their backs up to sit before they can stand on their legs. Most babies by 3 months can support their heads on their own so developmental activities during the 3-6 month should be focused on preparing baby for rolling and sitting. Lots of tummy time will help strength baby’s core and upper body. So spend lots of supervised tummy time, whether on your lap or on a fun activity mat. Doing lots of tummy time on the Boppy! Babies in their third to the sixth month are still captivated by high-contrast colors and patterns so bring out brightly colored toys, rattles, activity gyms, and picture card. Continue to read to your baby books with high-contrast patterns and colors like this one. Sensory toys that light up or makes noises when pressed or shaken will be your baby’s favorite at this age. Also still captivating is mirrors. Although babies don’t realize they are looking at themselves they really find their reflection fascinating and will even reach and smile at the little cutie in the mirror! You may also notice that your baby is beginning to take everything into her mouth. This is part of her sensory development so encourage your baby to explore a variety of items for her to grasp and safely mouth. Be especially careful of her surroundings as she tries to mouth even the tiniest objects such as coins, bits of food, and bugs. She could choke on these things so make sure the area is cleared of objects that are sharp or breakable or have small parts. Below are some baby play ideas you can try each month. Help baby improve his neck strength by propping him on a headrest. Bring a toy to get his attention then pull the toy away. Watch your baby try to lift his head from the headrest to follow the toy. Help baby prepares for crawling position by placing him on his tummy. Sit behind him and alternately flex his legs. Watch his arms to see what happens. After a few minutes, alternately flex his arms and see what happens. Sing songs to your baby to increase his attention to vocal tone, tempo, and pitch. Provide physical comfort and contact with infant massages. Pay special attention to his hands and fingers to encourage his awareness of fine motor ability. Help baby explore different scents by letting her smell a variety of items such as lemon, cinnamon, banana, cheese, and other foods. Avoid bringing her near unpleasant smells. Hide and seek – notice how your baby follows you with her eyes. Play hide and seek by ducking behind counters and chairs, then popping out to surprise her. While baby is lying on tummy kicking his legs, move his arms in alternating actions to simulate crawling. To help strengthen his neck muscles, place him on his tummy. Bring a toy to get his attention then move it upward to encourage him to lift his head. Practice sitting by holding the baby in your lap and support her lightly around her waist. Release her for a few seconds and let her balance herself. After a few times repeat the exercise on the floor, support her with your hands as she tries to balance herself. Enhance your baby’s self-esteem by giving her lots of mirror time. Let her see herself standing up, sitting, and close up. Put a hat on her head and watch her reach to her new image. Practice rolling by lying her on her back. Place a toy on each of her sides, just out of reach, so she’ll be encouraged to try to grasp the toys. Make bath time fun by placing different object and toys in the water. My son especially likes to see Munchkin Bath Bobbers waddle in his bath! Play can-you-get-it to help baby better control his reaching, grasping, and coordinating skills. Hold a toy within his reach, and slowly move it around. He’ll soon reach for it and eventually grasp it. Let your baby practice standing to help her develop her leg muscles and balance. While she’s in a sitting position, let her grab your thumbs, then gently pull her upright. Hold a toy in front of your baby to increase her desire to raise herself up. Then set the toy a few inches away from her to encourage her to go after it. Put a variety of small toys in a shallow container like a pot or bowl. Encourage baby to reach into the container for toys and bring it to you. Baby may begin to “army crawl” where he uses his arms to pull himself forward. You can enhance this skill by setting a toy several inches in front of your baby to inspire him to crawl forward. As you play with your developing baby, keep in mind to never shake him. Shaking, jostling, or vigorously bouncing a baby can cause severe injury or even death. Under no circumstances, whether shaking a baby for fun or for discipline (shaking to make the baby stop crying), never ever shake your baby. Different shapes of rattles that make different sounds. This little triangle is packed with activities to help stimulate baby’s sensory and fine motor skills. Each side of this 5-sided toy has different activities to keep baby entertained. I was super fascinated by this drum/mirror when I first saw it. I think it was meant to be a drum for baby to play with when sitting. However, I used it to train my son’s neck control. When tapped, the drum plays music and lights up! This is a great toy to help baby learn cause and effect. The keys felt very similar to a real piano and the tune it produces are lovely. I mentioned how this activity gym is my (and my son’s) favorite of all toys in my developmental activities for 0-3 month baby post. To this day ( my son is 8 months old) he still plays in this gym on a daily basis. Position the arch overhead for newborn exploration. Or, bring it down for tummy time and seating up. Here, Chunbao is just learning to sit with the support of a Boppy. The activities in the arch kept him entertained for a long time! 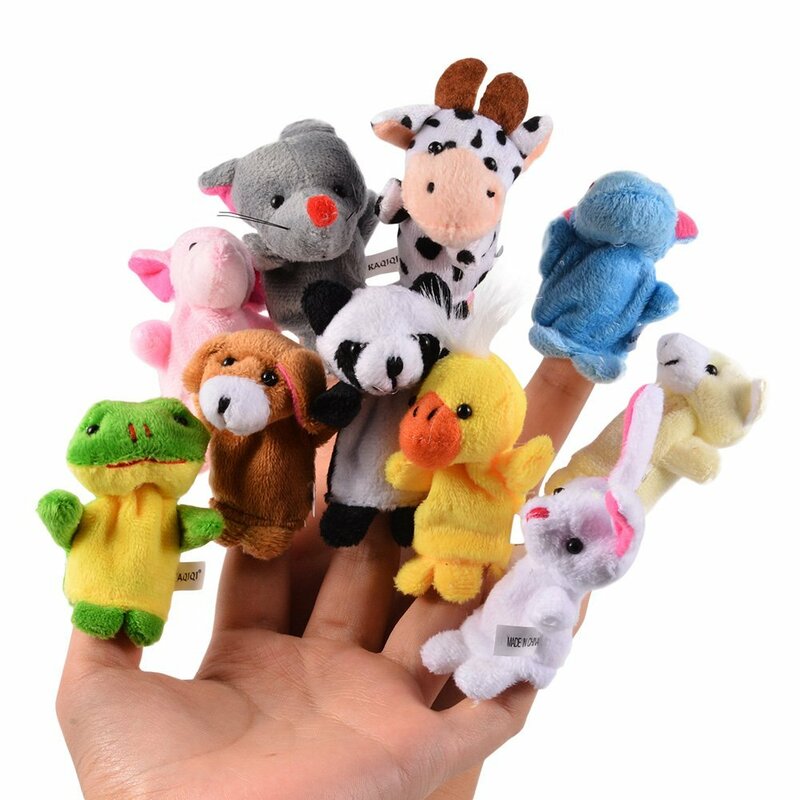 I love these velvety finger puppets. I used these to train my son on how to track objects. He’s usually enticed by the vibrant colors of the plushy creatures. As he gets a little bit older, I taught him how to say these animal names while we play. This Oball O-Copter is a bit heavier than the other rattle type toys we have. It is a great toy to play with as the baby develops more hand and grasp strength. These arctic creatures made my son’s bath time super fun. While we bathe him, he loves playing and grabbing these wobbly heads and delighted to see them sink and pop right out of the water. Who would think golf balls are great toys for a 3-6 month old? Its uneven surface stimulates sensory. Its size and substantial weight help with fine motor development. Baby can explore with his mouth and we mommy don’t have to worry it is a choking hazard. How do you play with your 3-6-month-old baby?